We offer medical-grade skin care products designed to help you achieve, maintain, and enhance your healthy skin. The line of products at GK Dermatology focuses on exceptional protection, hydration, and rejuvenation. Our products help with a wide spectrum of skin problems and cosmetic issues, including prevention of photo-damage and reversal of signs of aging skin. Formation of free radicals in the skin causes tissue damage, which makes the skin look wrinkled, dry, and aged. Most of our products contain anti-oxidants, such as Resveratrol, Caffeine, Green Tea Polyphenols, Coenzyme Q10, vitamins, and minerals, which soothe the skin and guard against free radicals thus helping restore skin’s youthful radiance. Our high-quality, chemical-free sunscreens help with prevention of sun damage and skin cancer. Finally, our customized skin care regimens significantly add to the management of skin conditions such as acne, rosacea and melasma. Moisturizer that forms a breathable “second skin” to provide instant hydration while reducing the signs of procedure. Does not suffocate the skin like other moisturizers do. Attracts oxygen while deliverung PCA, Hyaluronan, HLA, and Multi-tocopherols to ensure your skin is receiving maximum hydration and protection at the same time. Product Highlights: Contains 37% Ceravitae Oxygen Peptide Complex, PCA, Hyaluronan, HLA, Multi-tocopherols (Vitamin E), and Green Tea. Other qualities: gluten- and paraben-free, fragrance-free, hypo-allergenic, non-comedogenic (will not clog pores). Skin Type: Great for all skin types. An excellent option after cosmetic procedures. Instructions: After cleansing, apply over face and neck or as directed by your doctor. Product Highlights: moisturizer is fortified with Yucca glauca root extract, Ceramides, Vitamins A, C, E, and nourishing antioxidants, such as CoQ10 and Green Tea extract, to deliver smoother, softer skin. Other qualities: gluten-, oil- and fragrance-free, non-comedogenic (will not clog pores). Skin Type: Great for the dry skin patient who requires a heavier, but elegant moisturizer. Appropriate for all skin types. Instructions: After cleansing, apply once or twice daily or as directed by your doctor. Restorative is a rich night cream that nourishes dry skin back to optimum health. It leaves skin looking supple, firm, and soft, reduces the appearance of fine lines and wrinkles in mature skin, and enhances retinoid therapy. Product Highlights: Contains Ceramides, Tetrapeptide-21, Stem Cells, Antioxidants (Green Tea Polyphenols, Resveratrol, Caffeine), Hyaluronic Acid, Yucca Extract, Humectants & Emollients (Glycerin, Squalene, Phytospingosine). Other qualities: gluten- and paraben-free, hypo-allergenic. Skin Type: Great moisture-boosting, decadently rich night cream. Appropriate for all skin types. Instructions: After cleansing the skin, apply to the desired area (face, neck, décolleté) in the evening or as directed by your doctor. When used in conjunction with a retinoid, allow retinoid application to dry before applying cream. Non-Glycolic formula delivers sheer, oil-free hydration. Enriched with soothing Aloe Vera and nourishing Antioxidants to deliver smoother, softer skin. Product Highlights: Contains Aloe Barbadensis Leaf Juice, Vitamins A, C, E, CoQ10, Green Tea Extract, Squalane, and Glycerin. Other qualities: paraben-, gluten-, oil- and fragrance-free, non-comedogenic (will not clog pores). Skin Type: Ideal for the patient who is not overly dry, but requires a light moisturizer. Can be used for acne patients with dry skin. Instructions: Apply to affected area not more than 3 to 4 times daily, or as directed by your doctor. Formula helps restore and maintain a healthy skin barrier function while preventing moisture loss. A silky, fast absorbing body lotion that delivers a blend of nourishing, protective antioxidants such as Green Tea Polyphenols and Caffeine, Hyaluronic Acid, and emollients to help smooth and soften dry and irritated skin. Product Highlights: Contains Green Tea Polyphenols, Caffeine, Hyaluronic Acid, Yucca Extract, Ceramide 2, and Natural Sterols. Other qualities: paraben-, gluten-, oil- and fragrance-free, non-comedogenic (will not clog pores). Skin Type: Ideal, cosmetically elegant body moisturizing lotion. For all skin types. Instructions: Apply to skin once or twice daily, or as directed by your doctor. 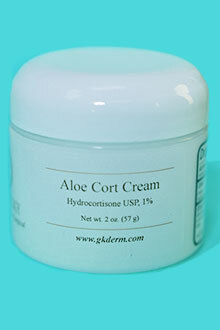 Ultra-soothing and moisturizing, water-based cream contains the purest grade of aloe vera and specially medicated with 1% hydrocortisone for the temporary relief of itching and inflammation. Product Highlights: Made from food-grade aloe vera gel to calm and soothe skin. Squalene and glycerin deliver superior hydrating benefits to help prevent against transepidermal water loss. Other qualities: gluten-, oil- and fragrance-free, non-comedogenic (will not clog pores). Instructions: After cleansing the skin apply sparingly to the desired area once or twice daily or as directed by your doctor. Skin Type: Great for minor skin irritations, facial redness, seborrheic dermatitis, and post-procedure skin conditions. Citrix® L-Ascorbic Acid Collagen Rejuvenation System (CRS) is a unique serum that reduces the appearance of lines and wrinkles, improves skin texture, tone and overall appearance, and diminishes the appearance of age spots. Product Highlights: Made from L-Ascorbic Acid (a powerful collagen-building antioxidant), Plant derived growth factors (stimulate collagen production), Polypeptides (strengthen and fortify new collagen), and Stem Cells that are derived from apples and citrus (provide intensive micronutrient support, required for healthy collagen). Other qualities: gluten-, oil-, alcohol-, surfactant- and fragrance-free. Skin Type: Great collagen stimulating formula. Appropriate for all skin types. Assists in the achievement of softer, smoother, firmer and more evenly toned skin. By delivering antioxidants in a moisturizing base it helps achieve more radiant looking skin. Increases firmness & elasticity, minimizes signs of aging such as wrinkles, fine lines, and redness. Product Highlights: Contains All-trans-Retinol, antioxidants such as Green Tea Polyphenols and Caffeine, and Hyaluronic Acid. Other qualities: gluten-, paraben-, and fragrance-free. Skin Type: For facial use only. Cosmetically pleasing retinoid that is well tolerated by all skin types. Instructions: Avoiding eye area, apply 3-4 pumps to to clean skin once a day, in the evening or as directed by your doctor. Speak with your physician before using if pregnant. Size: Available in a 1 fl. oz. silver airless pump dispenser bottle. Sheer, physical, antioxidant-rich sunscreen cream that is gentle on sensitive and acne prone skin. It provides broad spectrum protection against UVA and UVB rays. A weightless, residue-free, transparent finish formula, ideal complement for retinoid therapy. Product Highlights: Its active ingredient is Zinc Oxide 13.75%. Also contains Green Tea Polyphenols, Resveratrol, Embilica, CoQ10, and Vitamins A,C,E. Other qualities: gluten-, paraben-, oil-, alcohol-, and fragrance-free, non-comedogenic (will not clog pores). Skin Type: Sheer, chemical-free, non-greasy, all year-round sunscreen. Appropriate for all skin types. Instructions: Apply liberally at least 30 minutes before sun exposure. Reapply after swimming, excessive perspiring, or anytime after towel drying. Sheer, physical, antioxidant-rich sunscreen spray that is gentle on sensitive and acne prone skin. It provides broad spectrum protection against UVA and UVB rays, and is water resistant (40 minutes). A weightless, residue-free, transparent finish formula. Product Highlights: Its active ingredient is Zinc Oxide 12%. Also contains Green Tea Polyphenols, Resveratrol, Embilica, CoQ10, Vitamins A,C,E and Biotin. Other qualities: gluten-, paraben-, oil-, alcohol-, and fragrance-free, non-comedogenic (will not clog pores). Skin Type: Sheer, chemical-free, non-greasy spray sunscreen that is ideal for protection of scalp, trunk, and extremities. Appropriate for all skin types. A soap-free cleanser formulated with soothing antioxidants and botanicals to protect highly sensitive skin. It gently cleanses while providing hydration for the skin, and thoroughly removes environmental pollutants, excess oil and makeup. Product Highlights: Rich in antioxidants such as Green Tea Polyphenols and Emblica. Also, contains Panthenol (Pro Vitamin B), Ectoin, Chamomile Extract, Cucumber Extract, Yucca Root Extract, and Bisabolol. Other qualities: gluten-, paraben-, soap-, and alcohol-free, non-comedogenic (will not clog pores), contains hypoallergenic fragrance. Skin Type: Great for all skin types, especially sensitive skin. Instructions: Apply a moderate amount to wet skin and massage gently. Rinse clean with lukewarm water and towel dry. Use twice daily or as directed by your doctor. Foaming, moisturizing cleanser that is enhanced with liposome-encapsulated Vitamins, CoQ10 and Green Tea Extract to help quench free-radicals, and calm and soothe the skin. Product Highlights: Contains Vitamins A, C, E, CoQ10, Green Tea Extract, and Glycerin. Other qualities: gluten-, soap- and alcohol-free, non-comedogenic (will not clog pores). Skin Type: Calming and soothing cleanser. A perfect complement to Glycolic Acid therapy. Great for all skin types, especially sensitive skin. Instructions: Apply a moderate amount to wet skin and massage gently. Rinse clean with lukewarm water and towel dry. Skin Barrier Healing Ointment and Skin Protectant that provides a moist environment which helps dry skin and enhances healing. Product Highlights: Contains Petrolatum, Green Tea Extract, Ceramide 2 & 3, Vitamins E & B, Squalane, Yucca, and Glauca Root Extract. Other qualities: hypoallergenic, gluten-, paraben- and fragrance-free. Skin Type: Great for cuts, scrapes, burns, chapped or cracked skin. Ideal healing ointment after skin surgery and minor procedures. Appropriate for all skin types. Instructions: Apply liberally and often as directed by your physician. Formula with bio-friendly exfoliation beads that refines skin gently and effectively. It reveals fresh and pure complexion. It accelerates the natural renewal process of the skin while nourishing and hydrating it. This rich, creamy formula mildly cleanses the skin without stripping it of its natural moisture content. It helps to regulate oil, purify and minimize pores, and provides antioxidant protective coverage. Product Highlights: Made from 10% Glycolic and 0.5% Salicylic Acids and bio-friendly micro beads. It also contains Arbutin, a natural skin brightener, Green Tea Polyphenols, Vitamins A,C,E, Bisabolol, and CoQ10. Other qualities: gluten-, paraben-, oil- and sulfate-free, non-comedogenic (will not clog pores), contains hypoallergenic fragrance. Skin Type: Great exfoliator for face and other skin areas, such as those affected by keratosis pilaris. Appropriate for all skin types. Instructions: Apply a moderate amount to dry skin and massage gently into skin. Wet hands and continue to gently massage in a circular motion for 1 to 2 minutes. Rinse off thoroughly with lukewarm water and towel dry. Recommended for use 2-3 times a week or as directed by your doctor. Size: Available in a 6.7 fl. oz. tube.